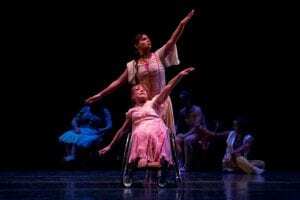 Mary Verdi-Fletcher opened the Dancing Wheels Company in 1980 after recognizing the lack of resources available for individuals with disabilities to train in dance with their non-disabled peers. Ten years later in 1990, Mary decided to expand and opened the school and training grounds that are still operating in Cleveland today. The Company is the first physically integrated dance company in America and one of the few fully operating companies and schools in the world. Raised in a family in which her father was a musician and her mother a professional dancer, Mary grew up with an appreciation and love for both music and dance. Being born with spina bifida, however, limited her ability to learn how to dance from traditional schools due to their lack of knowledge and understanding about individuals with disabilities. After showing interest in dance and wanting to learn more, Mary’s mother began to teach her and they started exploring how to integrate Mary with non-disabled dancers. A few years later, Mary entered a famous dance competition and received a standing ovation following her performance. She was chosen as an alternate to go to California and be on a national TV show, received major media attention, and was then asked to perform over 70 shows in her first year. The company grew from there and eventually became affiliated with the Cleveland Ballet, performing 50-70 shows per year and dancing for over 500,000 people since the company’s inception in 1980. Serving over 7,000 students around the globe with their outreach program, Mary’s favorite part of the school is “seeing the joy and wonderment on children’s faces when they discover that they can accomplish what no one else thought they could”. In the future, the Company plans to expand their international presence and are currently working on an accreditation program for those with disabilities can go to college and receive the same training and degrees in dance as their non-disabled peers. Want to learn more about the company and upcoming performances? Visit their website at https://dancingwheels.org/.